I spent the past week and a half in Kyiv, Ukraine – and have had a chance to see the political and social situation develop from the point of view of a local. These were some of the country’s most dramatic days in its recent history. Here are some observations, presented with what I hope is additional insight and little bias. 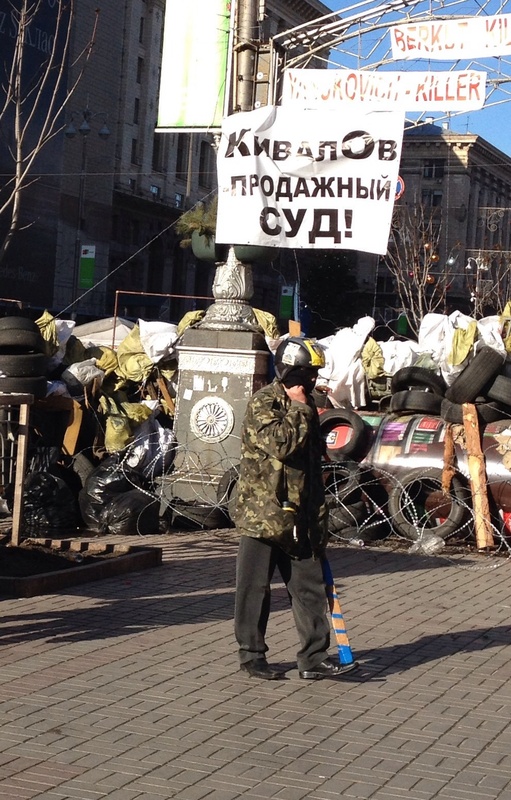 On Tuesday February 18th the Euromaidan was still fairly calm. From talking to family, there is a wide range of feelings towards the entire movement. Most, if not all, people support the cause: primarily, stronger ties with Europe and secondly, fewer ties with Russia. Some people believe the Maidan began with good reason but attracted too many participants only there looking for a good fight. 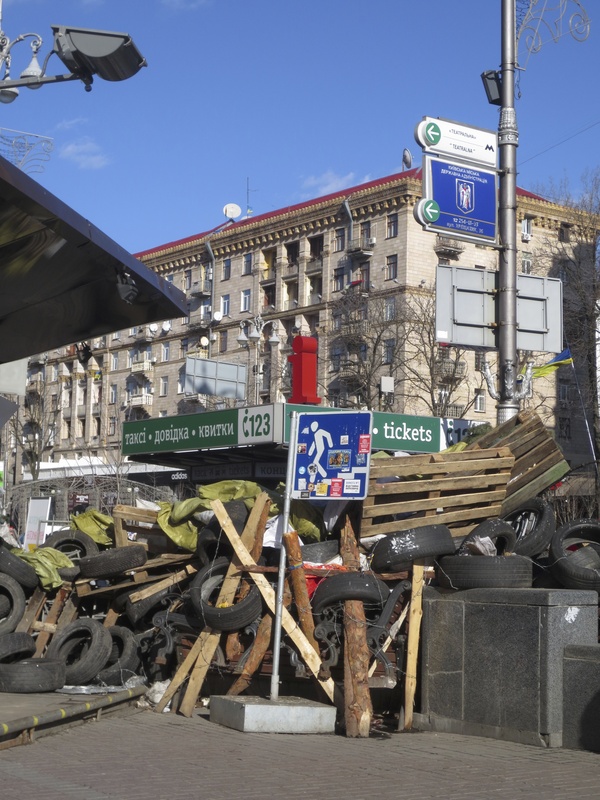 Many people resent the damage done to the beautiful city centre – broken pavement, ruined buildings, barricades of tires. The column of smoke from the Maidan is seen from across the city. Nearly everyone believes that the government is interfering in more ways that it admits – for example, hiring gangs of men to intimidate people in residential neighbourhoods (dressed similarly to the Maidan activists). Tuesday February 18th and Wednesday February 19th were the worst in terms of deaths – in and out of the city centre, the protesters as well as law enforcement officials. The entire metro system was shut down by government order and roads in and out of the city were either blocked or reduced to one lane, with heavy inspection in place. Trains to the suburbs were stuffed – windows were broken to fit in more passengers who were trying to get home. City bridges were either blocked or under heavy traffic. Because of the limits on transportation, the stores were immediately stocked out of essentials – every household in my family sent someone to buy bread, drinking water, and other staples. Credit cards stopped working for two days, and lines to ATMs were worrisome. Medicine prices doubled in a matter of hours and gas stations were running out of fuel. The Canadian Embassy was closed and unable to help with departures from the country; the advice was to lay low and leave as soon as possible unless staying in Ukraine was absolutely necessary. There was a general buzz of anxiety. Amid all this, there were hundreds of volunteers coming in to the hospitals, the makeshift hospitals in churches, and the free clinics established to treat the wounded. Other volunteers helped the police force keep the peace on the streets out of the city centre; unfortunately, a side effect of uprisings is a general upswing in unrelated street violence. After a week of uncertainty, most of the political events happened on Friday February 21st and Saturday February 22nd. The party with the former majority of seats in parliament lost many of its members, dropping from 1st to 3rd in size. Many of the dropouts tried to leave the country, and some (like the now-former Minister of Interior Affairs) were stopped in airports by border patrols. The imprisoned Tymoshenko was released. Presidential elections have been set for May 25th and the current president disappeared for a good part of the day, to be found in the evening just before his flight to Russia. In the meantime, the parliament decided to relieve him of his title (328 votes for, 0 against, 4 abstaining) and followed the results of the vote with a rendition of the national anthem (parts of which were televised, thank goodness – everyone needed a little bit of comic relief today). 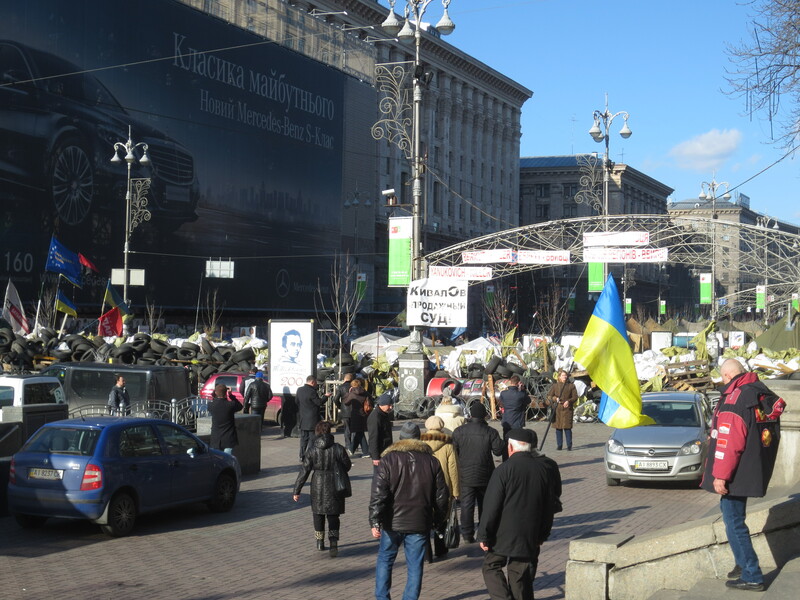 Immediately after being released from prison Tymoshenko made her way to the capital to address the Maidan. I believe that her speech was in reality the first speech of her presidential campaign. There cannot be a better position from which to run for presidency: she was a political prisoner of an unjust regime, and after being released made it clear that she attributed her freedom to the audacity of the Ukrainian population and to the activists of the Euromaidan. She condemns everything that they condemn, and will undoubtedly spend the next few months advocating her ability to overcome it – together. Speaking from a stage in her wheelchair, looking tired but determined, her appearance and speech is that of a woman ready to heal herself physically after attaining freedom. Her campaign will reflect the same goals for her country. The world is talking about Ukraine and so are Ukrainians. On a simple walk in the city it’s impossible to not come across a number of people discussing the president, the parliament, or the Maidan. I saw an older woman literally start scolding a policeman on a subway platform for the entire state of the country. The poor officer did not know what to do. My grandmother went to a dinner with friends where someone actually stormed out of the room because of differing opinions about the Maidan. Our family friends live closer to the centre and bring food and supplies to the activists, giving them full support. Everyone is involved – for better or for worse, this movement is all encompassing. For good reason – the standard of living is neither stable nor high in the country, and the resolution of this struggle for power will affect the future for every citizen on a very practical level. In terms of next steps, many people are suggesting a temporary governing body to be made of economists, sociologists, and other educated, politically uninvolved individuals. One variation of this is a body made of 49% delegates and 51% academics. This type of group would “clean up” the constitution and the economy before a true run of presidential elections. While this is noble aim, the issue that I see is the fact that the country needs to build solid external ties immediately to avoid bankruptcy. Strong political action is therefore a prerequisite to “fixing” the country. Perhaps what will work better is a true new government led by a president ready to take small steps, if not radical ones, to bring Ukraine closer to the Eurozone and most importantly to economic self sufficiency. Tags: Euromaidan, Kyiv, Maidan, Tymoshenko, Ukraine, Yanukovych. Bookmark the permalink.